I've just been reading Josephine Pullein-Thompson's Plenty of Ponies, which is one of her earliest works. 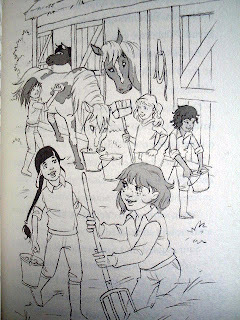 It's the story of the Esmonds, whose parents have, contrary to usual pony book form, hit good times, meaning that they now have a pony each, a large house and plenty of staff. Lewis says: "It's much easier to be nice if you're poor." Charlotte, his sister, says "I should think it's extremely difficult to be nice if you're really poor and don't have enough to eat and live in a slum, but I agree that it's good for one to be poverty-stricken like we were." 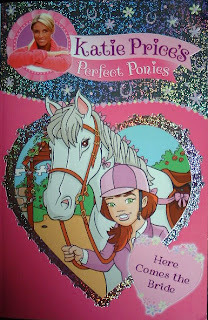 I would think it has to be Myrtle Green's "A Pony - Doctor's Orders" which succeeds in sounding like a breathless Mills and Boon. I can see it now. The tweed suited vet, his dark face twisted in a handsome sneer, tells the beautiful but bedraggled groom, hanging on desperately to the head of the plunging thoroughbred, completely failing to hold him steady as the vet does something Extremely Important: "A pony - that's all you're fit for. You'll never be woman enough for a horse. Or for me." A few years ago I bought some lily bulbs: I've always loved lilies, but struggled to grow them when we lived in London because of the lily beetles. Despite frequent night raids on them they had the better of me. So, I thought, after a few years had passed and dulled the pain, I'd try again. I bought some Madonna Lily bulbs, read the instructions, carefully dug holes, made little sand beds for the bulbs and sat back and hoped. 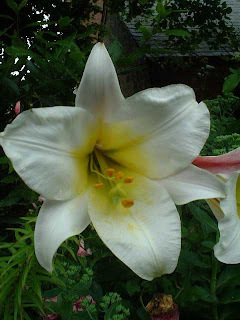 In the spring, the lilies poked little green heads above the soil. Every day I went out and inspected them, and soon they were about 5 inches tall. Daughter did the first of her secondary school induction days yesterday. She is the only one in her class going to this particular school; it's where her brother goes, and it's a good long stretch away from where we live. Yesterday I dropped them both off at the station: with an excellent start as her brother shot from the car like a bullet, leaving her trying to get her bags together and catch up. Fortunately as soon as he was out of my sight he upped his act, and daughter spent all free time at school being beseiged by what must have been most of year 10. They told her she looked nothing like her brother (just as well as he is 6' 5", hairy and unshaven), and yes, they patted her on the head. I thought they might.